First images of Beats' truly wireless Powerbeats Pro leak | What Hi-Fi? Yesterday we brought you news that the Apple-owned Beats brand is prepping its own truly wireless headphones called Powerbeats Pro – think of a Beats take on the new Apple AirPods. And now we've got a first look at them. The image above comes courtesy of 9to5Mac, who spotted it hidden in iOS 12.2. It shows a pair of Beats headphones that look identical to the Powerbeats 3 Wireless but without a connecting wire between the earbuds. The headphones are named in the operating system as Powerbeats Pro. According to the info contained within the iOS 12.2 release, they will have their own charging case for juicing up on the go, just like the new AirPods. So how will they differ from AirPods? For one, they will come in black as well as white, while AirPods only come in the latter. They will also be more suitable for gym bunnies, boasting different-sized ear tips, which – along with the clips – will help them stay put while you run. The Powerbeats Pro are expected to launch next month. As with the new AirPods, they will be powered by the H1 chip and will offer handsfree "Hey Siri" functionality, the latter confirmed by an interface within iOS 12.2. Their battery life could better the second-gen AirPods' five-hour spec, too. 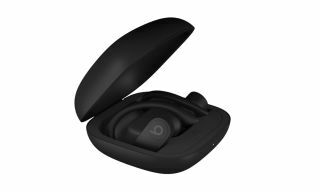 They're expected to cost more than the BeatsX (£109/$119.99), but whether they will be priced higher than the hugely popular AirPods remains to be seen. For their own sake, we hope not.